On November 30, 2018, at 8:29 a.m. AKST (17:29 UTC), a magnitude 7.1 earthquake hit South Central Alaska. The earthquake's epicenter was near Joint Base Elmendorf–Richardson, about 10 miles (16 km) north of Anchorage, and occurred at a depth of 29 miles (47 km). It was followed six minutes later by a magnitude 5.7 aftershock centered 2.5 miles (4.0 km) north-northwest of the municipality. The earthquake could be felt as far away as Fairbanks. The National Tsunami Warning Center—itself located inside the quake zone, in Palmer, Alaska, 42 miles (68 km) northeast of Anchorage—issued tsunami warnings for nearby coastal areas, including Cook Inlet and the Kenai Peninsula, but they were lifted shortly after. Southern Alaska lies at the eastern end of the Aleutian Trench, where the Pacific Plate is subducting beneath the North American Plate. Near Anchorage, the plates are converging at a rate of 57 mm per year. The region has experienced severe earthquakes in the past, including several megathrust earthquakes. The 1964 earthquake, with a magnitude of 9.2, was the largest earthquake in American history and the second largest to ever be recorded anywhere in the world. Though earthquakes are common in Alaska, they often occur out at sea. This earthquake is more similar to the 2001 Nisqually earthquake located near Tacoma, Washington, than to the 1964 megathrust earthquake. The earthquake had a magnitude of 7.1 on the moment magnitude scale using a centroid moment tensor inversion of the W-phase. The focal mechanism shows that the earthquake was a result of normal faulting. A fault dipping at 29° towards the east gives the best match to the observed seismic waveforms. The depth and mechanism are consistent with faulting within the down-going Pacific Plate. This implies that the earthquake was an intraslab earthquake within that plate, rather than at the plate boundary between the Pacific and North American Plates beneath the Anchorage area. This is a different mechanism than megathrust faults in the region, which do occur on the plate boundary itself. This faulting in the Pacific Plate is caused by downward bending while the plate is being forced under Alaska. Magnitude of 2018 Anchorage earthquake and aftershocks. Map of 2018 Anchorage earthquake and aftershocks. Severe damage to several buildings and a highway overpass near Ted Stevens Anchorage International Airport was reported. There were no casualties reported. The Kenai Peninsula Borough School District reported that all students were safe. Landings at four airports were temporarily affected by the earthquake: the Ted Stevens International Airport, Adak Airport, Merrill Field Airport and Joint Base Elmendorf–Richardson. The Anchorage Police Department reported major infrastructure damage across the city. Liquefaction was reported. Several traffic lights were knocked down, bringing traffic to a halt. Many roads were also damaged. The Glenn Highway was damaged to the point where officials stated it would likely take a long time to repair. A ramp connecting Minnesota Drive to area streets collapsed, as well as the surrounding hillside. A driver in an SUV who was on the section of destroyed highway was stranded, but uninjured. The Alaska Railroad had to suspend all operations due to severe damage at their operations center and unknown condition of tracks. The operators of the Trans-Alaska Pipeline shut the system down as a precaution; however, they reported that there is no known damage to the pipeline and it later resumed service. The newsroom studio of CBS-affiliate KTVA in Anchorage was heavily damaged, but the channel remained on the air. The Alaska Airlines Center, a large sports complex on the University of Alaska Anchorage (UAA) campus, flooded due to broken fire sprinkler pipes. Several trophy cases were also damaged. UAA's older Wells Fargo Sports Complex suffered similar damage. In South Anchorage, Dimond High School had ceiling tiles and other debris littering the floor throughout the campus. Most schools in the Anchorage School District suffered damage. Along with Dimond High, Colony Middle, Colony High and Bartlett High School were also heavily damaged. Colony Middle School suffered damage to ceiling tiles, water pipes, and lights and was being evaluated for structural damage. During the earthquake, a student suffered a broken wrist, and a custodian was injured by breaking glass at area schools. Several branches in the Anchorage Public Library system sustained damage. Numerous books were knocked off the shelves, which took days to clean up. Structural damage was noted in some locations. In the Anchorage community of Eagle River, at least one home collapsed during the earthquake. One man in the home, whose spouse was at work, was able to escape with several pets. There was also heavy damage in the Matanuska-Susitna Valley (Mat-Su), north of Anchorage. The Matanuska-Susitna Borough School District reported that Houston Middle School, located in the town of Houston, was severely damaged and will likely not reopen during the current school year. Five other schools will likely take longer than a week to reopen. Colony middle school students were the last to get to go back to learning. Significant damage was also done to roads in the Mat-Su. Among the most heavily damaged roads were the Palmer-Wasilla Highway, Pittman Road, Point MacKenzie Road and Vine Road. Suffering the worst damage was Vine Road, a section of which buckled and became impassable. In addition, Matanuska Electric Association reported that 46,000 customers were left without electricity immediately after the earthquake. Overall, damage in Anchorage was estimated to be at least US$30 million, including $10 million to repair pipes, and $10 million in public facilities. Damage estimates to the Anchorage School District ranged from $25 to $50 million. President Donald Trump stated on Twitter, "To the Great people of Alaska. You have been hit hard by a 'big one.' Please follow the directions of the highly trained professionals who are there to help you. Your Federal Government will spare no expense. God Bless you ALL!" A federal disaster was declared shortly after the earthquake and the Federal Emergency Management Agency deployed personnel from the state emergency operations center at Joint Base Elmendorf-Richardson to conduct relief operations. Alaska Governor Bill Walker said "It's been a 7.2 earthquake, but our response was a 10." Anchorage Mayor Ethan Berkowitz likewise declared a state of emergency for his city, and requested both state and federal assistance. The local public bus system, People Mover, ended service for the day following the earthquake. The city announced that regular bus service would resume the following day, and would be free of charge for the two days following the earthquake to help city residents get around on damaged roads. The Alaska Department of Transportation and Public Facilities moved quickly to inspect bridges and begin road repairs. Despite not normally paving during winter, area asphalt plants were restarted and within days sufficient repairs were made to reopen several heavily damaged roads. ^ a b c "Nov. 30 Southcentral quake's magnitude revised to 7.1". KTVA. Retrieved March 8, 2019. ^ a b c d "M 7.0 – 12km N of Anchorage, Alaska". United States Geological Survey. Retrieved November 30, 2018. ^ a b D'Oro, Rachel; Joling, Dan (November 30, 2018). "Powerful quakes buckle Alaska roads, trigger tsunami warning". Associated Press. Retrieved November 30, 2018. ^ "M 5.7 – 4km NNW of Anchorage, Alaska 2018-11-30 17:35:37 (UTC)". earthquake.usgs.gov. Retrieved November 30, 2018. ^ a b "The Latest: Scientists describe fault where quake happened". AP NEWS. November 30, 2018. Retrieved November 30, 2018. ^ a b c "Alaska earthquake: Anchorage rocked by 7.0 tremors". BBC News. November 30, 2018. Retrieved November 30, 2018. ^ a b "2018 Anchorage Earthquake". United States Geological Survey. November 30, 2018. Retrieved December 6, 2018. ^ Hillman, Anne; Healy, Jack; Fountain, Henry (November 30, 2018). "Earthquake Shreds Highways and Sows Panic in South Central Alaska". New York Times. Retrieved December 1, 2018. ^ Horazdovsky, Kortnie. "More than 80 aftershocks have hit Southcentral Alaska since Friday morning's quake". Retrieved December 1, 2018. ^ McGee, Madeline (February 6, 2019). "2 more aftershocks strike Anchorage within a half-hour". Anchorage Daily News. ^ "When will the aftershocks stop?". Alaska Earthquake Center. February 5, 2019. ^ "Large earthquake strikes Southcentral Alaska; tsunami warnings issued". Anchorage Daily News. November 30, 2018. Retrieved November 30, 2018. ^ "Huge earthquake rocks buildings in Anchorage; tsunami warning issued". CBS News. November 30, 2018. Retrieved November 30, 2018. ^ a b CNN, Ray Sanchez, Amanda Watts and Dakin Andone. "7.0 Alaska quake damages roads, brings scenes of chaos". CNN. Retrieved November 30, 2018. ^ "7.0 magnitude earthquake rocks Southcentral". KTVA. November 30, 2018. Retrieved December 1, 2018. ^ Bragg, Beth (December 1, 2018). "Alaska Airlines Center gym floor flooded after earthquake". Anchorage Daily News. Retrieved December 2, 2018. ^ a b DeMarban, Alex (November 30, 2018). "Anchorage schools, many Mat-Su schools to be closed Monday and Tuesday". Anchorage Daily News. Retrieved December 2, 2018. ^ Hollander, Zak (December 1, 2018). "Injuries, road damage and gas leaks reported in Mat-Su after 7.0 earthquake". Anchroage Daily News. Retrieved December 2, 2018. ^ Ballard, Shannon; Vigil, Joe (December 1, 2018). "ASD assesses few injuries, extensive damage at Anchorage schools". KTVA. Retrieved December 2, 2018. ^ "APL hours during earthquake cleanup". Anchorage Public Libraries. Retrieved December 4, 2018. ^ Tunseth, Matt (December 2, 2018). "Eagle River couple feels lucky after home collapses in earthquake". Anchorage Daily News. Retrieved December 3, 2018. ^ Horazdovsky, Kortnie; Burke, Jill (December 3, 2018). 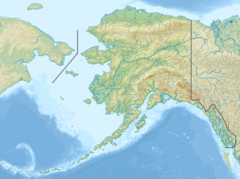 "Mat-Su District: One school may not be re-opened this year after quake". KTUU-TV. Retrieved December 3, 2018. ^ Wilson, Shawn. "Colony Middle School students return to school after November 30th earthquake". www.ktuu.com. Retrieved April 2, 2019. ^ Bartz, Jeremiah (December 1, 2018). "FRIDAY THE 30TH: Massive earthquake rocks the Valley". Mat-Su Valley Frontiersman. Retrieved December 3, 2018. ^ Kevin, Delly (December 14, 2018). "City of Anchorage estimates $30 million and counting in earthquake damage". Anchorage daily news. Retrieved December 15, 2018. ^ Hanlan, Tegan (December 14, 2018). "Anchorage School District earthquake damage could approach $50 million". Anchorage daily news. Retrieved December 15, 2018. ^ @realDonaldTrump (November 30, 2018). "To the Great people of Alaska. You have been hit hard by a "big one." Please follow the directions of the highly trained professionals who are there to help you. Your Federal Government will spare no expense. God Bless you ALL!" (Tweet) – via Twitter. ^ "Federal disaster declared for Southcentral earthquake". Anchorage Daily News. November 30, 2018. Retrieved December 1, 2018. ^ "Updated: major earthquake damages buildings and roads in Anchorage". KTOO. November 30, 2018. ^ Griggs, Mary Beth (December 8, 2018). "How Alaska fixed its earthquake-shattered roads in just days". The Verge. Retrieved December 10, 2018.